De Hoop Vlei, 40 kilometers south-east of Bredasdorp in the Western Cape, is the olderst Ramsar wetland in South Africa (12 March 1975 – same date as Barberspan in North-west). The Ramsar wetland is restricted to 750 hectares, but the total area of the De Hoop Nature Reserve is a massive 36,000 hectares. The reserve is classified as a World Heritage site due to its variety of fynbos (endemic plants), the rich bio-diversity, and a 70 kilometers pristine beach. The Marine Protected Area (MPA) stretches 5 kilometres into the sea and is one of the biggest MPAs in South Africa. This created the ideal nursery for the Southern Right Whale which is one of the main attractions at De Hoop. Up to 184 mother/calf combinations have been observed here, more than 40% of the total estimated population. The high dunes at Koppie Alleen provide a good view point with the best time between May and December. There are 86 mammal species that can be viewed with a self-drive through the reserve. This includes Bontebok, Cape Mountain Zebras, Eland, Reedbuck, and predators such as Caracal and Leopard. 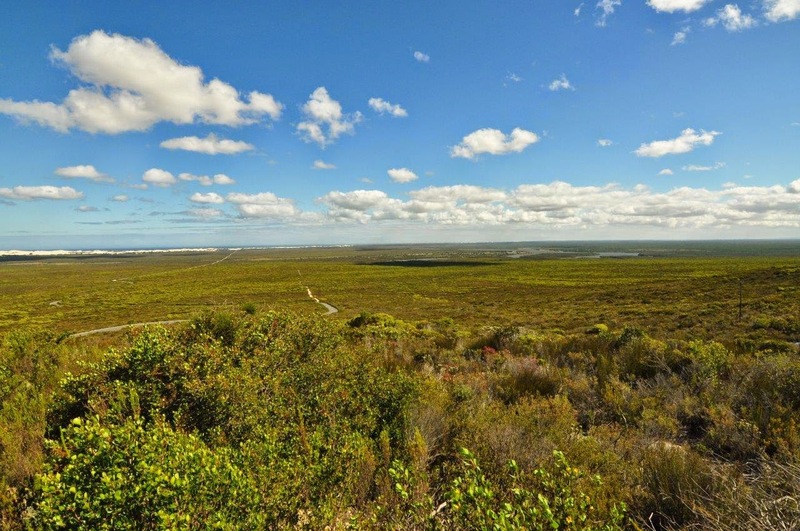 De Hoop is internationally recognized as an Important Bird and Biodiversity Area (IBA) with 260 bird species. The wetlands support up to 30,000 birds at times with an average of 8,000 birds at a time. Greater and Lesser Flamingoes, Great White Pelicans, South African Shelduck, Cape Shoveler, Maccoa Duck, Great Crested Grebe and Little Grebe are some of the species you will see in and around the water. In the rest of the park you can expect to see Denham’s Bustard, Karoo Korhaan, Chestnut-banded Plover, Black Harriers, and Lanner Falcon. There is a hide from where you can watch 60 breeding pairs of the endangered Cape Vulture. Accommodation at De Hoop varies from 5-star luxury guest houses to a camping site on the banks of the wetlands. There is a restaurant and boutique shop where you can buy the basic necessaties for self-catering. The reserve is renowned for its many hiking trails - short trails from 5 kilometers up to the famous 5-day Whale Trail. Several mountain bike routes up to a total of 50 kilometers in total can be followed with a guide, or by yourself. De Hoop has a low rainfall average of 350mm per year, mostly during winter with August the wettest month. It gets very hot in summer but mild in winter.